Israeli Knesset has elected its Speaker Reuven Rivlin as the new President to replace the war criminal Shimon Peres who is due to retire in July 2014. It was another blow to Netanyahu’s political clout at the home front. Netanyahu campaigned against Rivlin’s candidacy as he did in 2007 in support of Peres. In a desperate move to stop Rivlin wining the presidency, Netanyahu tried to persuade Naftali Bennett and Yair Lapid to support the Holocaust fabricator Elie Wiesel, neither a citizen nor a resident of the Zionist entity to become its new president. Rivlin who was born into an Austrian Jewish family in occupied Palestine is considered a “Dove” by his war-mongering Likud mafia. Rivlin is one of those few Zionist leaders who believe that treating the Arabs more “humanely” while living on lands stolen from them, would be good for the long interests of the illegal Jewish settlers. That’s why I call him the “Righteous Zionist”. I can list his following actions in support of my claim. 1. In December 2011, Rivlin supported a bill in Israeli Knesset asking Washington to recognize Armenian genocide committed by Turkish Crypto Jewish elites. 2. His father professor Yosef Yoel Rivlin was the first Jew who translated Holy Qur’an in Hebrew. He also translated ‘One Thousand and one Nights’. 3. His cousin Lilly Rivlin, who lived in United States for a while, is a writer and producer of film, ‘Can You Hear Me? : Israeli and Palestinian Women Fight for Peace’. 4. He is dead against the American “two-state solution”. He supports one democratic Jewish state of Israel with equal rights and freedom of speech to all its Jewish, Muslim and Christian citizens. 5. He has criticized politicians, rabbis, sport fans, etc. for racism based on religion and ethnicity. 6. He has disapproved Netanyahu’s anti-Iran rants and criticism of the so-called “P5+1” negotiations with Iran. Rivlin believes that no American administration would dare to throw Israel under the bus. 7. He protected Native Palestinian Knesset member Hanin Zoabi when the Jewish-controlled Knesset tried to sanction her for taking part in the Gaza flotilla and even elevated MK Ahmed Tibi, the Palestinian Israelis most love to hate, to deputy-Speaker. 8. 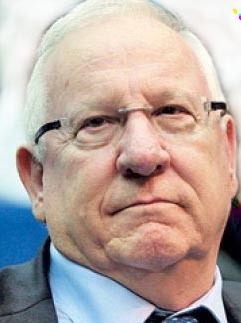 In March 2009, Rivlin acknowledged the “great suffering and real trauma” endured by Palestinians in 1948 and called for compensations for the Nakba. Rivlin will be Israel’s first president who is not linked with Israel Occupation Force (IOF). Shimon Peres is known as the Father of Jewish Nuclear Bomb. Israel’s presidency is a symbolic with no executive powers like India’s president Shri Paranab Mukherjee. It wields no power, but huge prestige. And Rivlin will know what to do with it. Yes, as a true Zionist disciple of Theodor Herzl, Rivlin believe in Eretz Yisrael.